Welcome to the Orisa Lifestyle Member Site! The purpose of this site is to facilitate your Personal Priesthood. I hope that you will count on it like a trusted friend, for the answers to your simplest and most complex questions about Orisa Lifestyle. Every week, I'll add new activities for you to do alone, with your family and members of your community. Of course, a website cannot do it all. So, please also consider the other supporting resources that are at your disposal at www.ObafemiO.com. 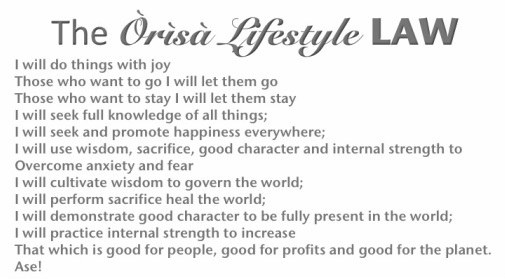 The activities you'll find here on the member site are based on the Orisa Lifestyle Pledge and Law. By doing these activities, you will learn more about what it means to live the medicine. For example, when you share your personal story with others, you are helping inspire others to transcend adversity. When you improve your position in business or at work, you are also improving the lives of the people you serve. Write down what each line of the Pledge and Law mean to YOU personally. Discuss these ideas with the people closest to you. Feel free to email your responses to [email protected] as well. People across the United States and around the world are doing these exact same activities. Live the medicine!